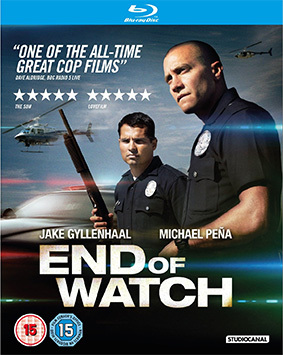 In their mission to abide by their oath to serve and protect, Officer Brian Taylor (Jake Gyllenhaal) and Officer Mike Zavala (Michael Peña) have formed a powerful brotherhood to ensure they both go home at the End of Watch. The only guarantee for these officers is that there are no guarantees when patrolling the streets of South Central, Los Angeles. Danger presents itself to the dedicated duo daily, and soon the pair find themselves inadvertently targets of powerful cartels. Between the blue lights, blaring sirens and adrenaline pumping action thrives an honest and often humorous banter between partners who spend most of their days in a police car awaiting the next call. The officers have formed a bond that allows them to function as a unit in the face of danger, knowing full well, at any moment, they could be called on to lay down their lives. Writer/Director/Producer David Ayer (Training Day) was driven to get the story of Los Angeles cops "right," and open a window into a rarely seen world of law enforcement for all its truth, grit and compassion. Although widely acclaimed, not all were quite so impressed, with our own Timothy E. RAW calling it "a series of increasingly nasty skirmishes culminating in POV shaky cam blast-o-rama and nothing more" (you can read the whole review here). If you didn't catch the film on it's cinema run, then hang on a couple of weeks and you'll be able to buy it on Blu-ray, DVD or as an EST download from Studiocanal at the RRP of £22.99 for the Blu-ray and £17.99 for the DVD, or £13.99 for the HD version and £9.99 for the SD edition on iTunes.